Fri. & Sat. at 7:30pm. Tickets are $125 per person. Enjoy a champagne after-party meet & greet with Patrick. Take a picture with the man himself and leave with a signed headshot! Judy Garland, Liza Minnelli, Patrick Russo: Two legends in one man. Join us for a one-of-a-kind event at Fountain Hills Theater, as Patrick recreates an unforgettable evening of impersonation. 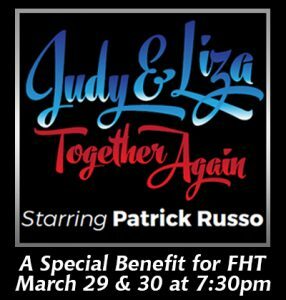 Listen to Judy and Liza sing your favorite songs while Patrick brings them to life on stage before your eyes. The night will end with Patrick singing a few songs as himself.